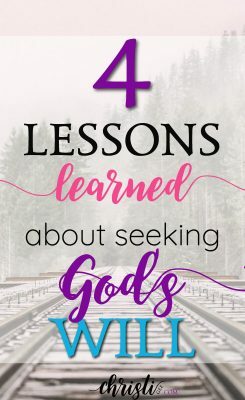 After seeking God’s guidance and searching for his will more in the last few years than in all the decades of my adult life, I wrote about my process. It was a simple post outlining seven steps I use. And it took off. For my little corner of the Internet, it was “viral.” It seems this topic is one we all wrestle with. 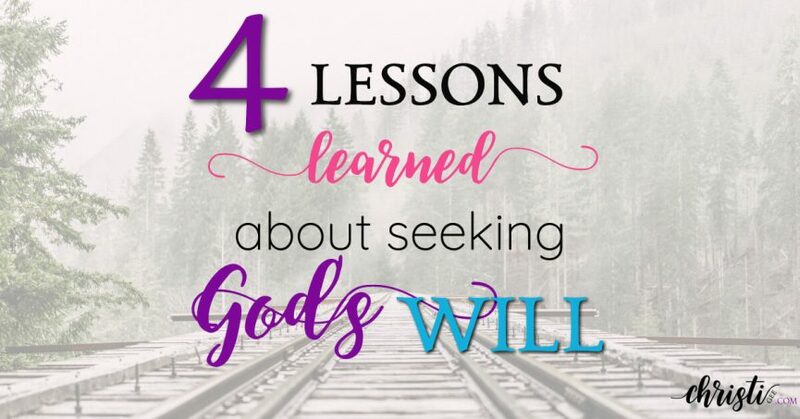 As I wrote that article, my family discussed what has bubbled to the surface, helping us to summarize and categorize what we’ve learned from Scripture and from the process of seeking God’s will. My daughter said the advice that has had the greatest impact on her is the wisdom shared from studying Nehemiah. Nehemiah’s life was bathed in prayer, but he rarely ONLY prayed. Prayer was usually accompanied by action. 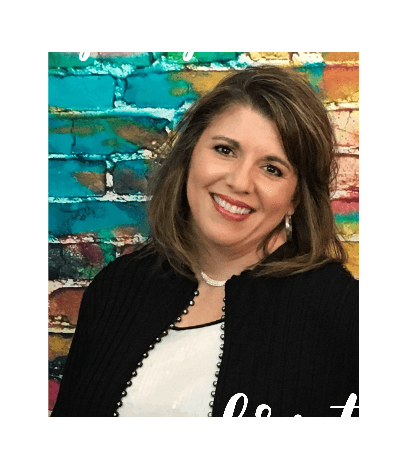 As we have helped her navigate choices, we first talk through road blocks or red flags. Once we determine there aren’t any worth stopping for, we’ve encouraged her to move forward, praying as she goes. A young man spent time serving in Calcutta, during which he had the opportunity to visit with Mother Teresa. He asked her to pray that he would have clarity about his direction. The man questioned her, assuming she herself had gained clarity through her years of serving God as she served the poor. This hit home with us. We have finally embraced this reality: we rarely get clarity before we act. Clarity is a grace and a gift when God gives it, but it cannot be a determining factor for acting or not acting. but faith is what we need. So we stopped praying for clarity when seeking God’s guidance and asked him to grow our trust — and with it, our confidence and courage to act. And through that, we’ve discovered that sometimes clarity comes after we’ve taken a few steps. We also do not expect God’s will to line up with the easiest decision. 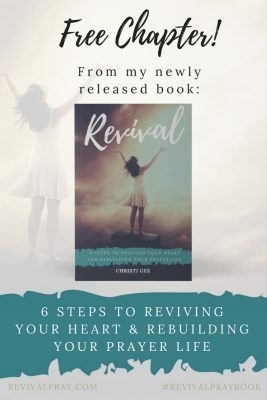 Although we assess road blocks and red flags as part of acting wisely, they don’t get the role of “determining factor.” In fact, we’ve learned firsthand that moving in God’s plan often means hardship ahead. If we allow “easy” to dictate the choice, then when it’s no longer easy, we will second-guess the decision. That’s never helpful and rarely Spirit-inspired. In fact, in my experience — when the road becomes difficult and I want to give in — it’s usually the enemy who is whispering in my ear. I wrote about one of our most God-ordained decisions that ultimately was more difficult than anything we had done. He shared the quote with me and then we shared it with our children. Those nine words have informed our family’s thinking and invaded our conversations over and over. We have a group texting chain that is often full of memes and gifs and quips related to this idea. The truth is — it means way more than we can even comprehend. We are learning to act in our time and trust in God’s timing. I imagine this will be a lifelong process. For the 7-step process or any of the other takeaways above to apply, you must already be pointed in the right direction. God’s written Word about his will for life and godliness is our “North star.” (His will for you will never contradict his Word.) If you’re not pointing North seeking God in obedience to Scripture, you won’t discover the right direction for your life. But if you’re pointing North, then step forward and keep stepping. not a crystal ball into the future. 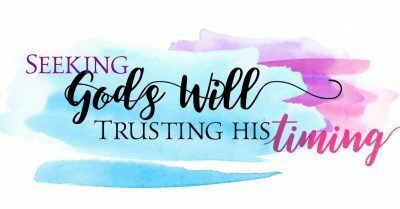 An index list of posts about seeking God’s will and trusting His timing. I am in love with these posts. I am drawn to posts like this and am lapping them up like water! There are so many nuggets of gold in here. Thank you! I was the person that prayed and prayed for God to show me the plan He had for my life. Oh – I prayed, wrote in my journal, pleaded for God to “just show me what to do.” I spent atleast two years waiting for clarity and ignoring the small “sense” of that first step. It wasn’t until I finally took that step that God started revealing more. It’s hard to make those moves sometimes, but like you said, we have to have faith. I know this well, friend. Thanks for being here and affirming the reality of this journey of faith!